Typing without digital crutches increases your speed and makes you a better human (sort of). Awhile back, everyone was complaining and/or joking about the existential iOS autocorrect bug that prevented you from typing “I”. At first, I had no idea what everyone was talking about. I hadn’t been experiencing the bug at all. But then I realized why. I disabled autocorrect about two years ago. And I don’t miss it one bit. Do I make typos? Of course, but so do you and with your autocorrect. Do I type faster? I think so when you factor the overall words per minute. See, there are two things that I always hated about autocorrect and autocomplete. Many times, it guessed the wrong word. So, that meant I had to go back and correct it, which was frustrating and clunky. In the long run, autocorrect is teaching me one insidious skill: how to type sloppily. Typing with autocorrect is like bowling with bumpers. After a while, it’s a completely different game. Instead of trying to bowl straight down the lane, you learn to bounce off the bumpers in expected ways. iOS learns to compensate for your sloppiness and in turn, you adapt to typing sloppily. If your text fixes itself, why bother being more accurate? If you think about how often you type on your phone, that means hours and hours of practice. Every single day, you’re practicing typing. If you practiced piano or unicycling that long, you’d be a world-class expert. But most of us don’t. Mostly, we practice sloppy typing. So, we never get better. The technology gets better, so our output improves, but our typing skills don’t. This, of course, isn’t a big deal. No one’s going to win a Nobel Peace Prize in iPhone typing. But I think you should try it out. Just for fun. Turn off autocorrect for a week and see how it goes. See what life is like when you’re responsible for fixing your own mistakes. Go to Settings, then General, then Keyboard. 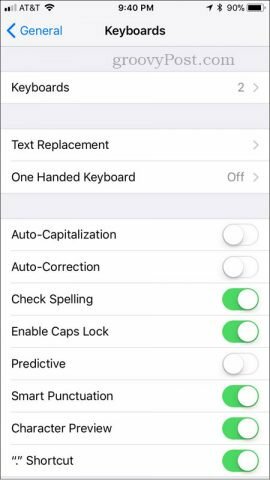 Then, disable Auto-Capitalization, Auto-Correction, Predictive and any other digital crutches you want to shed. I’ll give you one tip as you embark on this challenge: take your time. Instead of trying to type as fast as you can, try to type steadily. Type on a beat, with rhythm, like your fingers are marching along the keyboard. I do this, and it helps me immensely. It slows me down so I make fewer mistakes and it activates my muscle memory as I go. It’s like learning a song—once you become familiar with it, you’ll be able to play it at a faster tempo. This is better than blasting through the words you can type easily and then stumble when you get to the hard words. Keep it steady, accurate, and on a beat. Let me know in the comments how you do. Or, if you’ve already turned your back on autocorrect, let me know why and how. Thank you for the great tips! I may wean from auto typing features in my Samsung devces. I will take your advice to type to the beat. That should help me become a much better, rhythmic e-typist! In my 1960s high school’s office practice class, our teacher told us we could improve speed and accuracy by typing words, instead of letters! Auto-correct is a tool I use. I also generally check it twice and…I never have enabled it or I have disenabled it on smartphones. Way back in the dark ages when auto-correct first appeared in word processing programs, I got rather indignant and told it to stop trying to control what I was typing, and turned it off. Every device I’ve owned since then has been ‘adjusted’ similarly the moment I turn them on. Why is everyone obsessed with speed? Learn from mistakes and THINK! The auto-correct on my Samsung Galaxy 3 has a sense of humor.